Here is I created called '10 Licks in E minor.' 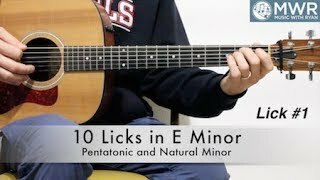 We'll be checking out 10 awesome licks using both the minor pentatonic scales and the natural minor scales. This lesson will have a lot of David Rawlings influence with both styles of licks of particularly the 'natural minor' scales.